Dental implants, for the right patient, are a very effective long-lasting solution for a variety of functional and cosmetic dental problems. First things first, a dental implant is not the tooth or teeth that you can see. The dental implant is actually a replacement root or roots of the tooth or teeth which are affixed to the jaw during dental implant surgery. The dental implant surgeon attaches and affixes the implant to the jawbone and to the implant the visible “tooth” is secured. It looks and works just like your own tooth. Dental implants, depending on the need, can be used for a single tooth or multiple teeth. The most common material used by dental implant surgeons in dental implants is titanium because it is light weight, strong and inert which means that it is very unlikely to be rejected by your body and fuses to the bone well. Titanium is the same metal used by orthopaedic surgeons in joint replacement surgery. It is this that gives a dental implant its strength and longevity. The external overlying crown or bridge. Dental implants are strong and long-lasting because of the process known as osseointergration which is essentially the process of the implant fusing into the jaw bone and then becoming part of the jaw structure. 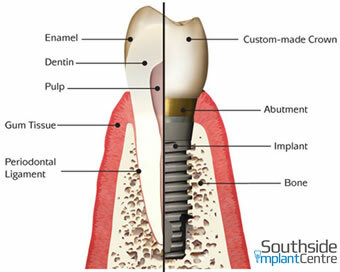 The other great advantage of a dental implant is that dental implants don’t rely on other teeth for support. Dental implants are suitable for most patients. To find out more about dental implants and their suitability for you please call Southside Implant Centre on 9525 7725, Click to enquire on Dental Implant Costs here or view our completed Dental implant galley.